I love pandan anything, the smell of pandan leaves, pandan chiffon cake, Mamak's pandan kaya roti, Chat Thai's pandan custard dessert, the list goes on. 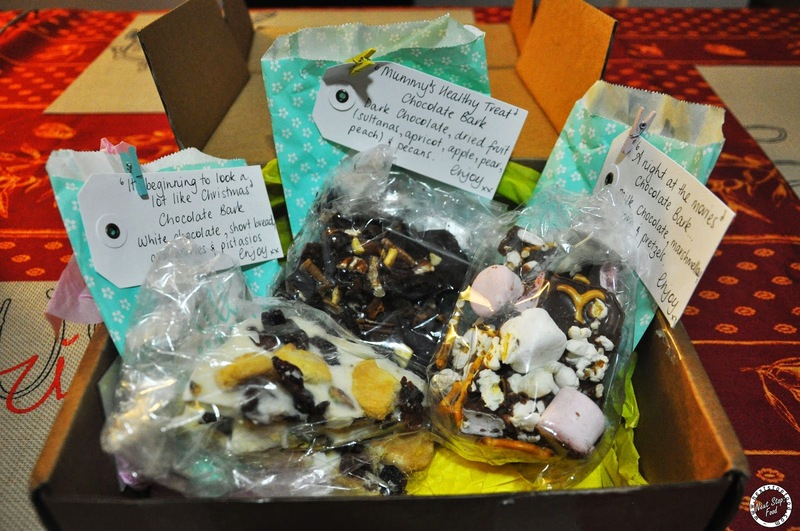 This year when I found out about The Sweet Swap, I immediately signed up because who doesn't like to receive surprise parcels! A little background about The Sweet Swap - it is formed by Amanda and Sara where participants mail desserts to 3 allocated matches. What's more, our registration fee goes towards Child Fund Australia, so we get surprise desserts AND help a charity, win-win! 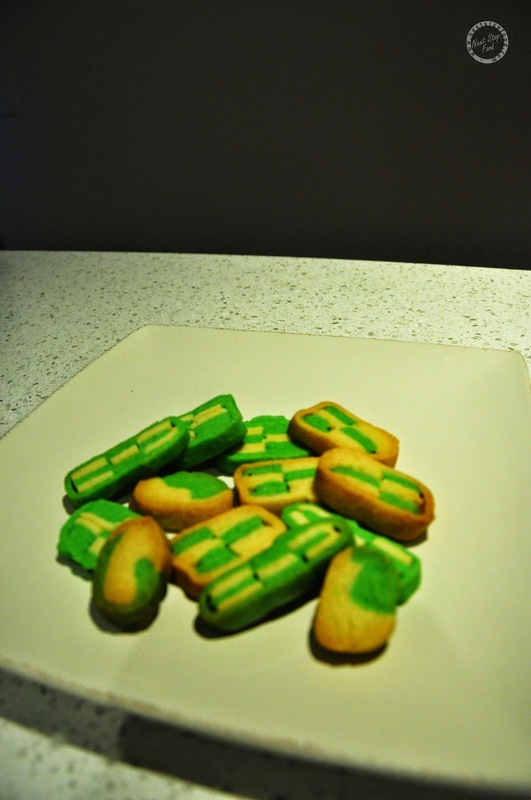 Since I want to make something with pandan and it needs to be non perishable, I came up with the idea of pandan cookies! Thanks to google, I found a checkered cookie recipe from Cornercafe and also decided to make pandan paste from scratch with recipe found at Liza Messycorner. When cutting up the cookie dough, I didn't follow the recipe measurements which I regret because I rolled the dough WAY too thin so the cookies didn't look nice :/ So remember to follow the measurements! And here's my lovely surprise parcels! 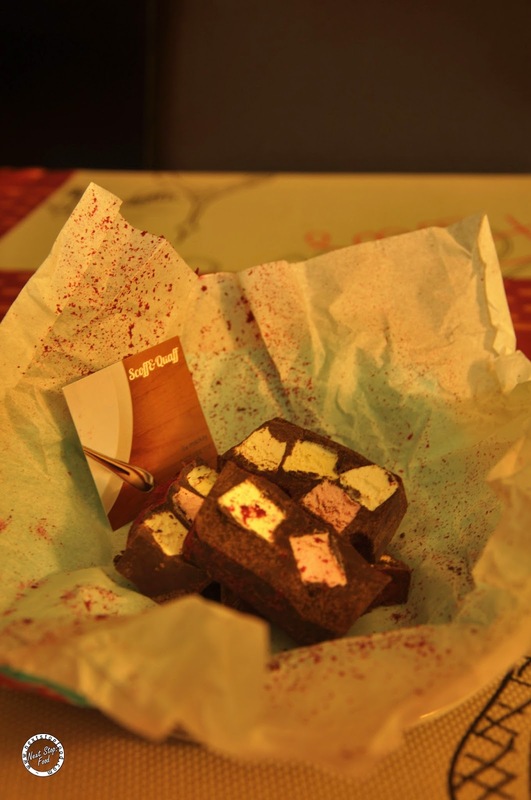 I got chocolate barks from Good Food Week and Rocky Road from Scoff & Quaff. I still haven't received my third one as yet. Dear 3rd Parcel, hope you're in good hands! 1. In a mixer, cream softened butter and sugar until pale and fluffy then beat in egg until combined. Add vanilla and mix well. Fold in sifted flour mixture, and mix into a soft dough. 2. Divide dough into 2 equal portion, about 400g each. Mix pandan paste into one portion and leave the other portion plain. 3. Take the green portion and remove about 150g from it to make the smaller green portion. Pat and slightly flatten both green portions into a rough rectangle, wrap individually in cling wrap and put into the refrigerator to chill for at least 1 hour to harden. Repeat the same process with the plain portion. 4. Take the larger of the green and plain doughs out from the refrigerator and leave on the counter for 15 to 30 minutes to soften slightly. 5. Roll out the green portion to 1cm thick and a rectangle of about 10cm × 20cm. Using a ruler, mark out 1cm intervals on the short side, you want nine 1cm × 20cm strips. Discard the rugged strips from the two ends, but don’t throw them away, just stick them back onto the smaller green portion in the refrigerator. Using a pizza wheel or a knife, cut out the strips, using a ruler for accurate cutting. Repeat the process with the large plain portion. 6. Take 4 green strips and 5 plain strips, and make a log with a checkerboard pattern, pressing lightly to help them stick together. If you feel the dough is a bit dry, brush the strips with a little water. Repeat the process with the remaining 4 plain strips and 5 green strips to make another log, in reverse colour of checkerboard. Wrap the logs separately in cling wrap and chill again until harden, at least 1 hour. In all stages, chill the dough immediately if you feel the dough starts to soften and difficult to handle, especially in hot weather. 7. Take the small green and plain doughs out from the refrigerator and leave on the counter for 15 to 30 minutes to soften slightly. 8. Roll out the green dough into a rectangle of about 15cm × 20cm. Place a checkerboard log, the one with plain colour on the four corners, on the roll-out green rectangle, matching the 20cm side of the log with the 20cm side of the green rectangle. Roll up like a Swiss roll, so that the log is completely encased in the green dough. Trim off edges (don’t throw away, round any trimmings into small balls, flatten and bake). Wrap the complete log in cling wrap and chill again until firm, preferably overnight. 9. Preheat oven to 180°C. With a very sharp knife, cut the log into 6mm thick (1/4-inch) slices and arrange them on a lined baking sheet, about 2cm apart. Bake for 12 to 15 minutes, or until firm and just slightly golden brown around the edges. (You may also bake them in 150°C oven for 25 to 30 minutes.) Cool on baking sheet for 5 minutes before transferring onto a wire rack to cool completely. 3. Pour pandan in a fine strainer, squeeze out all the pandan juices. 4. 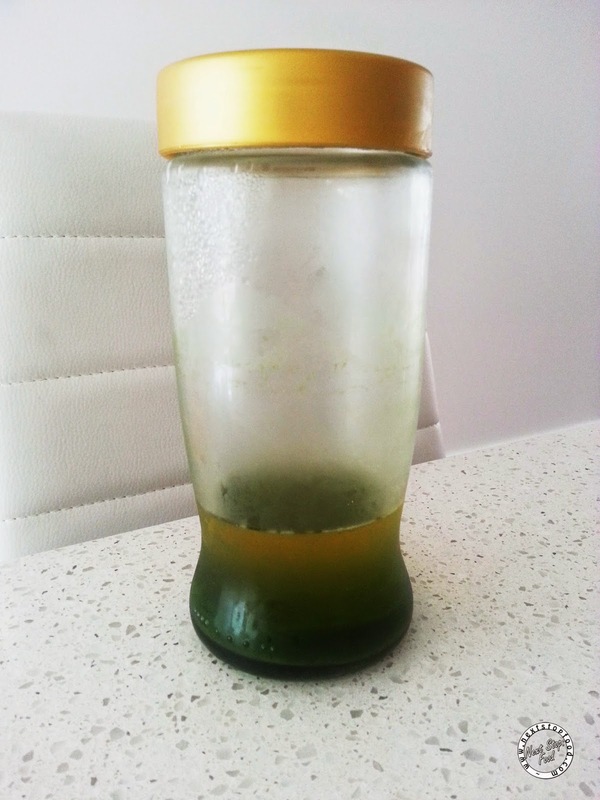 Pour the pandan juices in jars, and leave it in the fridge. The paste can keep up to two weeks in the fridge, throw away if it smells of rotten leaves! They might be a smaller checkerboard but I bet your cookies tasted awesome! Your checkerboard cookies look awesome!!! I've attempted checkerboard cookies before and they didn't look this nice! I've tried sourcing fresh pandan leaves but wasn't successful, so have used pandan paste (commercially made) and it isn't as nice! Hehe thanks :) I bought fresh pandan leaves from Marrickville, it's cheap there too! Oh no! Rogue parcel.... and it was Simon's!! :( Some person just ate extraordinarily good salted butterscotch truffles. 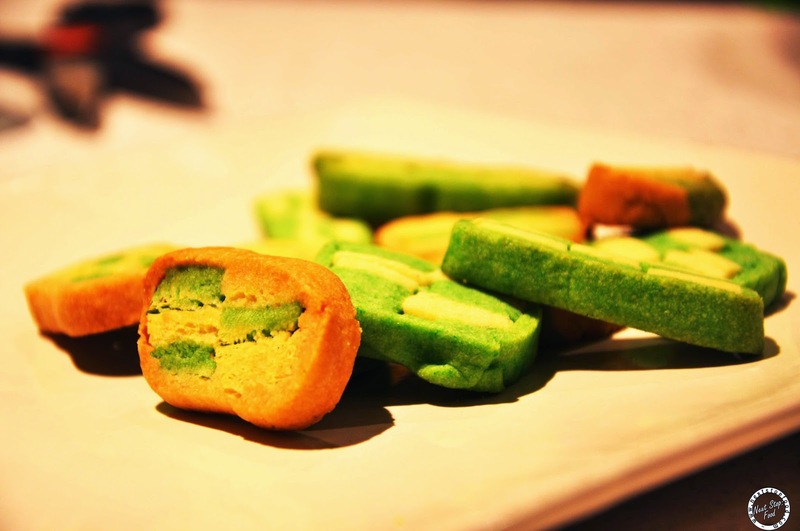 Love your pandan cookies - they sound spectacular. Thanks for taking part this year!